This plunger churn dates from 19th century. It was called a plunger churn because the dairymaid plunged the tool up and down vigorously. It was also known as the Scottish churn. Butter churners like this one were used in many dairy farms in the 19th century along with the milking stool, butter pats and butter prints. It is made of three parts - the churn, the plunger/dasher and the lid. The wood has shrunk because of repeated wetting and drying out and so the barrel is narrower than it was originally. You can see where the metal bands have slipped down because the original rings are lighter on the wood. The wooden plunger looks like a long broom handle and at the end is a circular disc with holes. This was sometimes called a dasher. The lid fitted on top to stop the cream splashing over in waves when it was churned. The dairymaid put soured cream in the churner, filling it half-full. Any more and it would splash over the top and be too heavy to churn. She churned the butter using her strong arms and a steady rhythm, raising the plunger all the way up and pushed it all the way down, turning the plunger around as she did so. She kept this up for around an hour and a half - an exhausting job. As the dairymaid churned, the cream got thicker and thicker. Eventually it separated into small balls of butter and thin cloudy buttermilk or whey. The butter was then removed from the churn and washed in cold water. All the air and water was squeezed out. Salt was added to preserve the butter. Lastly, the butter was shaped into bricks using butter pats or scotch hands. 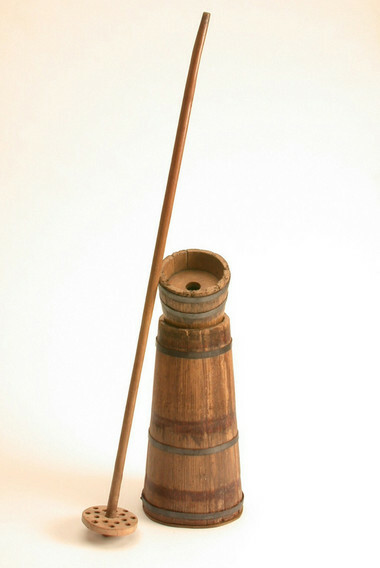 This type of plunger churn dates back to the 16th century. It is one of the earliest types of plunger used to make butter. Before the invention of the churn, people made butter by shaking cream inside an animal skin. There were different kinds of churn besides the plunger churn. In the 18th century, hanging churns were popular - these rocked back and forth to churn the cream. The box butter churner (or paddle churner) made the butter by turning a handle that moved paddles up and down inside the box. These were made of wood, glass or earthenware. The barrel churn was mounted on a sturdy stand and the whole barrel turned 'over-and-over' by a handle. It was sometimes called the 'over-and-over' or 'end-over-end' churn. People with just one or two cows had often had a blow churn - a glass jar with one small wooden paddle turned by a small handle. Everything was done by hand in the 19th century dairy, from milking to churning to making the butter into pats. This meant it was very time-consuming and labour intensive. Butter was usually made once a week, and it took up a full day. The farmer's wife or daughters did the milking and made the butter, and sometimes dairymaids were employed on a large farm. Dairying and preparing food was seen as women's work. Making butter involved several stages - milking the cows, cooling the milk, skimming off the cream, churning the butter and making it into pats. Firstly, the diarymaid milked the cows and collected the milk in a pail. Then the milk was set in milk pans in the dairy and left for a day for the cream to rise to the surface. The dairymaid skimmed off the cream and put it in a container in cold place, like a cellar or pantry. This was done for several days in a row until enough cream had been collected to make butter. The cream was left to sour in that time. This helped the butter to separate from the milk when it was churned. It was very important to get the temperature of the cream right in making butter. If the cream was too hot the butter would be soft and puffy. If the cream was too cold the balls of butter wouldn't stick together. Room temperature was best - between 50-68* Fahrenheit or 10-12* Celsius. The cream was often left out for a while before churning so that it could reach room temperature. If it was too cold, warm water was stirred in with the plunger to gather the butter together. After the butter formed balls, the dairymaid drained off the buttermilk and rinsed the butter using clean water in the plunger. The buttermilk had to be removed because it would make the butter go off and taste rancid. It was drunk by the family or fed to the farm animals. The butter was scooped out of the churn and put in the butter worker (also called a butter roller). This was a shallow wooden trough with a fluted roller that rolled up and down the trough when the handle was turned. The dairymaid put more water on the butter and then squeezed it out using butter worker. This was done repeatedly until all the cloudy buttermilk had been removed. When the water ran clear, the butter was clean. Lastly, she squeezed the butter to get rid of the water and air that could make it go mouldy. Then she added and mixed in salt to preserve the butter. Finally, the butter was made into brick shapes using butter pats on a wooden board, and printed it with a stamp. Then it was ready to eat or to sell at market.